The lore surrounding ghosts is no less extensive and esoteric than in any other fantasy that human beings engage in. Googling “ghost types” garners about 30 million hits for me, but only because Google thinks I was looking for something about Pokemon. Going a bit more formal with the language and googling “types of ghosts” leads to about 11 million hits. Hardly any more manageable, but at least this time Google hasn’t confused my search with a video game. Many pages detail the physical characteristics, categorizing spectral apparitions as orbs, vapors, mists, shadows, rods of light, even corkscrews. There are lists which deal with animal ghosts. Strangely appealing are object ghosts, like ships or cars, supposedly manifestations of intense energy emitted by their passengers. There is a lot of information out there in the real world for anyone curious enough to look. Looking further, at types of hauntings, reveals that there are between four and six different types of hauntings here in the western world, depending on which resource a user picks out. The most common type of haunting, according to the internet, is a residual haunting, where energy left behind by a deceased person or persons manifests as ghosts who repeat their actions, on a loop, for all eternity. It’s not an intelligent haunting. That is, the ghosts cannot interact with any living thing which happens to be present. The world is merely a screen on which these ghosts are projected. 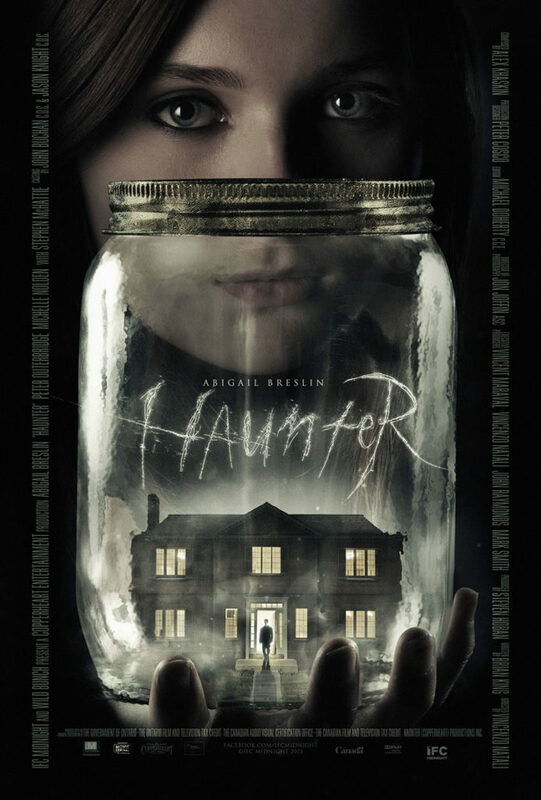 I bring all this up because today’s film, Haunter, deals with a residual haunting, with a bit of a twist. Lisa Johnson (Abigail Breslin) is just like any other fifteen year-old girl the day before her birthday: she’s in a bitchy mood. But she has genuine reasons for her petulance. The house she and her family live in is haunted, and only Lisa realizes it. To make matters worse, it’s Lisa and her family that are doing the haunting. They are all dead, looping the same day, the day of all their deaths, over and over and over again. They’ve been at it for decades, as evidenced by the wall-mounted telephones, Atari 2600, family truckster in the garage, and Lisa’s skinny jeans. Wait, what? All that work went into making the Johnson family home a museum piece of 1980s American living, and my suspension of disbelief was undone by a pair of pants. It was Lisa as a whole, really. She looks like a teenager from today dropped into the ’80s, not a child of it. Trust me, I was there. Anyway, they’re all dead. But recently, Lisa figured that out, and she has grown sick of the endless string of repeating days. She has transformed her part of the haunting into an intelligent haunting, where the spirits can interact with the living. That’s exactly what she does, contacting the teenaged girl who lives in the house. But, the Johnson family aren’t the only ghosts occupying the house. There are ghosts all over the place, occupying different dimensional spaces based on the time in which they lived. One in particular, played by Stephen McHattie, seems to be responsible for it all. He warns Lisa quite clearly that if she continues to communicate with the living, there’s going to be trouble. He didn’t know what kind of insufferable teenager he was dealing with, which leads to the film’s major events. Director Vincenzo Natali and screenwriter Matthew Brian King have taken common ghost tropes and turned them back on the viewer. They’re not the first to do so, nor the first to do it right (The Others). The ideas behind the film are smart, but also just a touch better than their execution. There are a large number of lines of dialogue that made me either laugh or roll my eyes, much like a certain angsty teenager in the film is wont to do. Only, Breslin is the one saying and butchering most of these lines. Once upon a time, Breslin was nominated for an Oscar, so I know she can act. Half the time in this film, act is what she does. But the combination of uneven dialogue and bad takes from the star does a lot to diminish the quality of an otherwise good film. It’s unfortunate that the audience has to get past the weakness of the lead and the weaknesses in the script to continue to enjoy the film, but that’s the way it is. It is, put simply, an up and down film. Most of the time it’s quite good. But when it falls flat, even if it’s only for a second or two, it does a fair amount of damage.